A quick and delicious side dish that goes very well with alcohol! Corn cheese (콘치즈) is a quick, simple but also delicious side dish. It is quite often used in Korea as a side dish but is most popular as anju (안주). 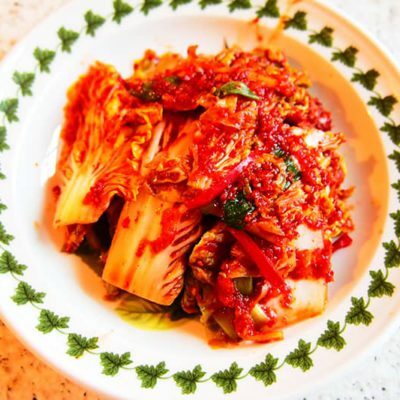 Anju is a general term used in Korea to describe food that is usually eaten with alcohol. If you want to impress your friends just whip up some corn cheese, grab a bottle of soju (소주) and socialize Korean style! The tinned sweetcorn we get here in the UK is generally quite sweet already and so if you decide to use tinned sweetcorn for this recipe you can leave out the sugar. If, however, you decide to use corn straight from the cob then leave the sugar in. Drain off any liquid from your can of sweetcorn. Melt the unsalted butter in a frying pan and add the sweetcorn. Fry for roughly 5 minutes on a medium heat. Add the mayonnaise and sugar, mix well, and continue to fry for a further 2 minutes. Transfer the corn to an ovenproof dish, sprinkle the mozzarella evenly over the corn and pop it under the grill for roughly 3 minutes, or until the cheese has melted and has turned golden brown in places.